Today, I am thrilled to share with you the Framer sets that I designed and are now available for pre-order at Paper Wings Productions. 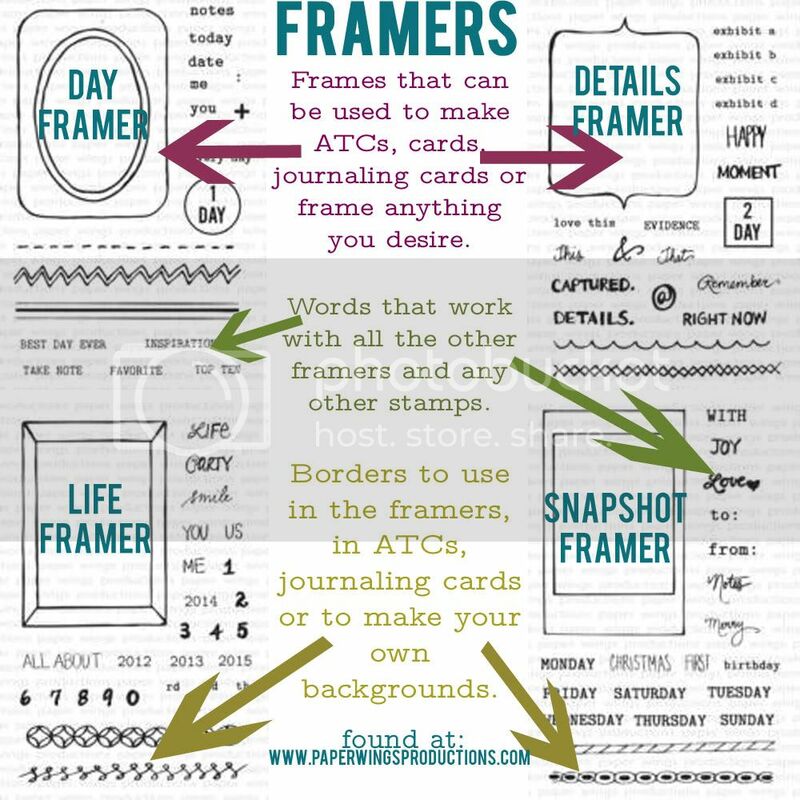 I created these Framers with Project Life, ATCs, tags and card making in mind to name a few things. The images include hand drawn images, handwritten words along with a font that makes mixing up the two fun. 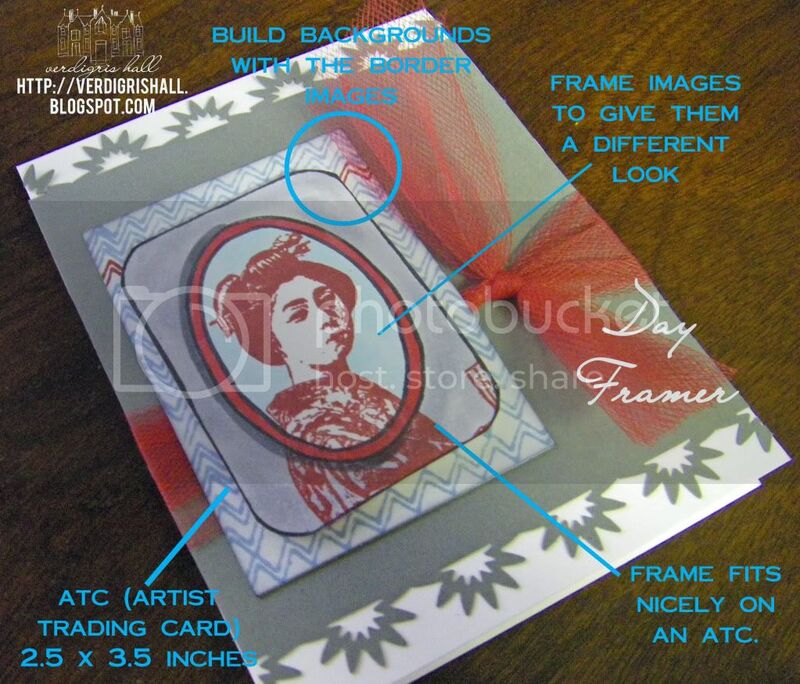 Like the diagram mentions above, the borders can be used in conjunction with the frames or as backgrounds. 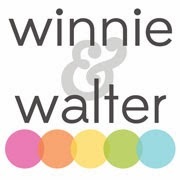 They can be added to any tag, journaling card, card, layout or tag as a border, decorative element or as a line. The words from the sets all work with each other and the frames and borders. You can add the day of the week onto any of the frames for instance or use the words on a card, mini book, tag, gift or whatever you can dream up. You will notice that the geisha from the Geishas set could have been contained within the inner oval frame, but I decided to let her also go onto the onto the larger frame. The frame in the Day Framer set is one stamp, but you could easily use just the rounded rectangle or just the oval. On the image above the oval looks like it is cut out and put on top of the rounded rectangle frame with dimensional adhesive, but for this card I simply used Copics to give it a shadow. I also shaded in the the rectangle frame so it would recede from the eye a bit. 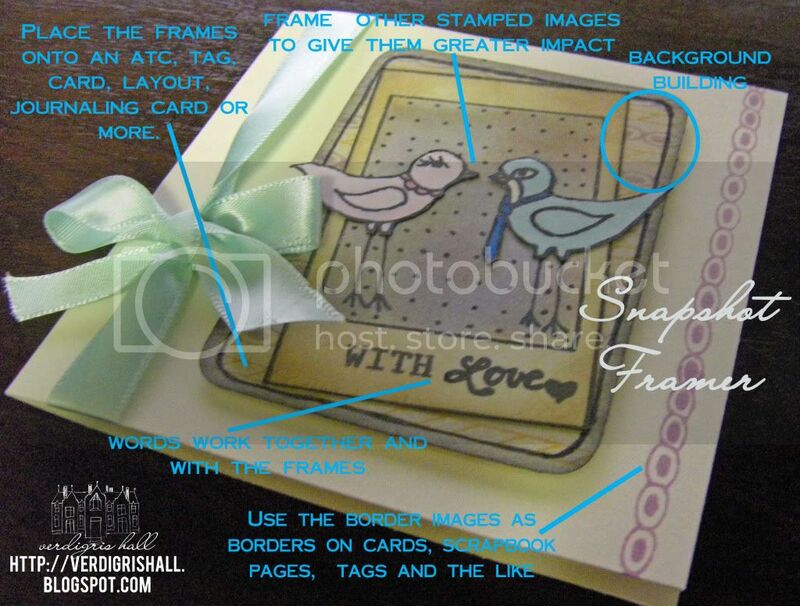 You will notice that the birds from Birds of a Feather go off the frame, but for a different look you could mask off the edge of the frame so the stamps were contained within the inner rectangle. The words "with" "love" are found in the set and fit perfectly on the snapshot frame for a sentiment or label for the frame. I hope you have found this helpful. Come back very soon for more about the Framers and other Paper Wings Productions stamps. 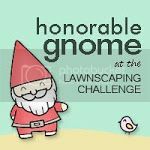 For more Paper Wings Productions inspiration, please visit my friend, Julie's blog and Paper Wings Productions. If you have any questions, please do not hesitate to comment here or email me at shay@paperwingsproductions.com. What a great idea! I really like your frame designs, and I am so happy you have started your design business. I can see you doing those leaps (graceful, I am sure!) Thanks for the ideas!